I have a habit of going into see a show completely blind: by reading as little as possible about it. I enjoy finding out about the work as the actors play it. Going in to see Bone Cage at Hart House, I was unaware that Catherine Banks, the playwright, was the recipient of the 2008 Governor General’s Literary Award for Drama. 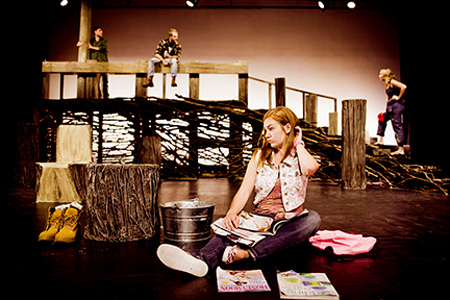 Bone Cage is a dark play that explores the emotional turmoil of 5 people living in rural Nova Scotia. Each character has their own story line about the harsh life of working the land and living in a tough working class Canadian village. Walking into the theatre I could tell immediately where I was and had a sense of the emotional environment I was entering. I would like to applaud the design team: set designer Elizabeth Kantor, costume designer Ming Wong, lighting designer David DeGrow, and sound designer Alexander Punzalan Junior. Together they made a rich and immersive world for the audience. With their well crafted designs we were transported away from the theatre and into the very real world of the play. Watching the work I found that it raised many important issues: the emotional turmoil of destroying the land you depend on; living with a father figure who tried to sexually assault you, the immobilizing pain of losing a child; and entering into a loveless marriage, only to mention a few. It is important to write about these issues and I appreciated hearing stories that are not normally a part of my life, though I was left wanting more detail and a focus on a narrower range of subjects. By trying to address everything I was left unsure of what I had just seen. With 5 characters, any of which could have been the lead, each of them was struggling to keep my attention. Storylines should not always be finished and served to us with a nice conclusion, but none of the storylines in this play seemed to end. The characters hardly took steps to better their lives; when they did, they were shot down and reminded of their “menial” lives. The lack of action and the despair of a never ending cycle of depression was too much for me. As my show buddy reminded me, the play was obviously created and acted with passion and it showed. Each actor brought the characters to life and together were a great ensemble.